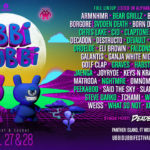 Ubbi Dubbi Festival Phase Two Lineup Announced! 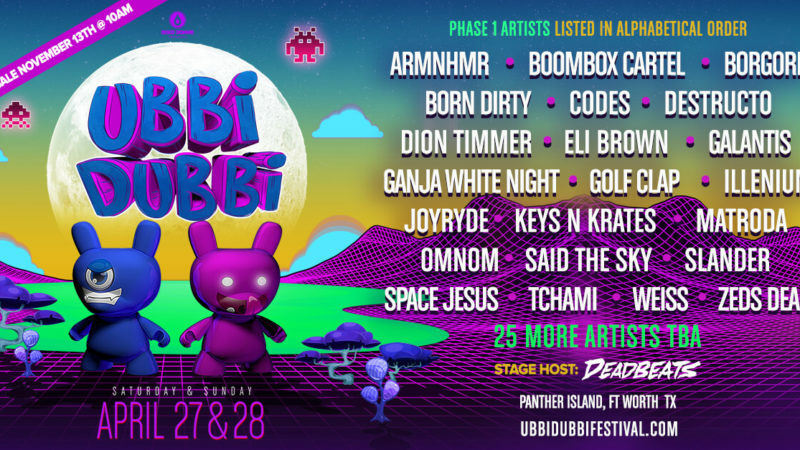 We are proud to announce the second phase of artists for the inaugural edition of the Ubbi Dubbi Festival! 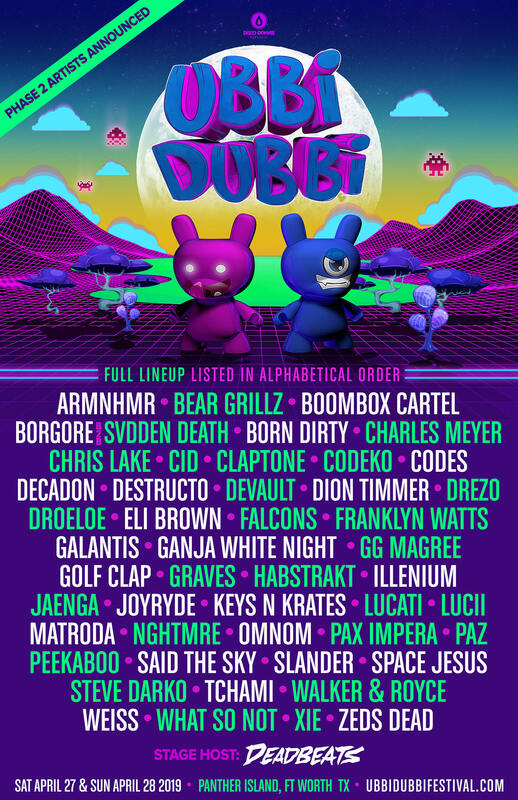 Set to take place on Panther Island in Fort Worth, Texas on Saturday, April 27th and Sunday, April 28th, Ubbi Dubbi is slated to be springtime’s premier dance music event! Secure your entry at the lowest available price and buy your tickets now! 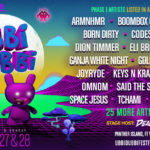 Phase 1 Lineup Announced and Early Bird Tickets on Sale for Ubbi Dubbi 2019! 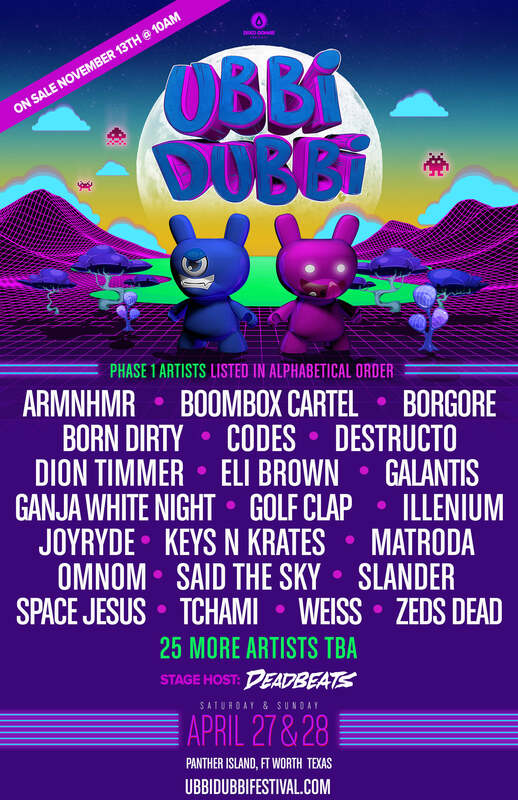 We are proud to announce the first phase of artist announcements for Ubbi Dubbi, a brand new festival taking place on Panther Island in Fort Worth, Texas on Saturday, April 27th and Sunday, April 28th! Grab festival passes to the springtime celebration today and take advantage of the lowest available price. 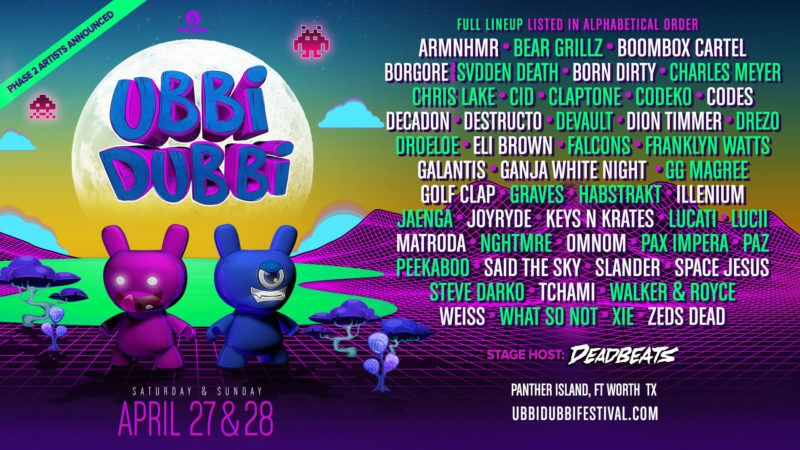 Buy early bird tickets for Ubbi Dubbi 2019! 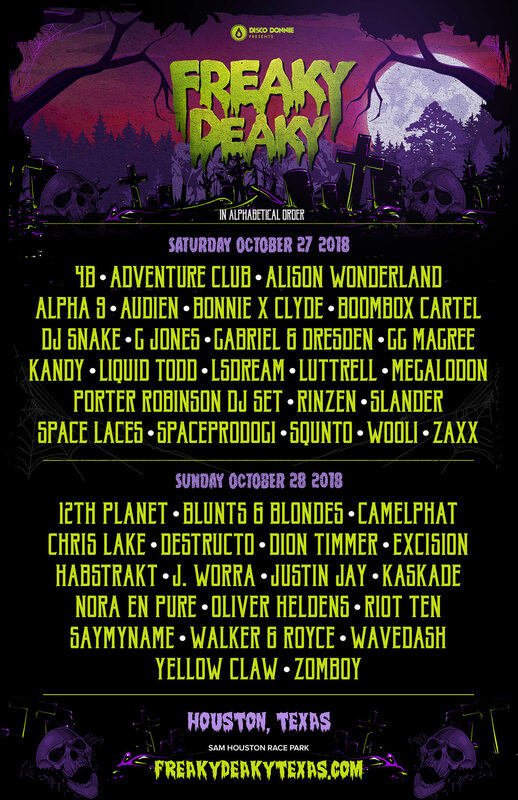 Announcing the Complete Lineup for Freaky Deaky Texas 2018! Assemble your motley crew, don creepy costumes, and escape all earthly inhibitions for two days of dancing on the dark side, October 27-28th, at Sam Houston Race Park for Freaky Deaky Texas. We’ll revel in the underworld of electronic artists and get into the spirit of Freaky Deaky as we adventure across festival grounds to explore what lies beyond. Buy tickets now or start a payment plan at checkout! Freaky Deaky Early Bird Tickets Now on Sale! Enter if you dare for a twisted celebration of freaks from far and wide. Our spooky exploration of sound will release your inhibitions with two days of dancing on the dark side, October 27-28th, in the bayou city! Scoop up early bird tickets to get festival passes at rock bottom prices, on sale now! 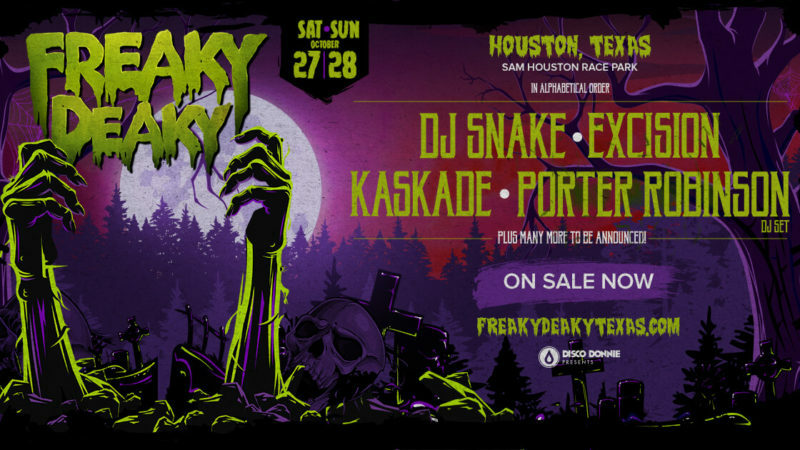 Darkness descends on Houston as we proudly announce the arrival of 2018’s halloween festival – Freaky Deaky! Tickets go on sale Thursday, June 14th at 10:00 AM CT! Presenting the Complete Lineup for Sunset Music Festival 2018! Get ready to dance the weekend away under the shining Florida sun during our Memorial Day weekend celebration at Tampa’s Raymond James Stadium for Sunset Music Festival. On Saturday, May 26th and Sunday, May 27th, we’re bringing out the hottest acts in electronic music to provide the perfect soundtrack to start the summer! Get a Pair of Tickets for Your Valentine! From free hugs to stealing kisses, there’s no denying that love is in the air at Ultimate Music Experience. This year for Valentine’s Day, give your sweetheart the gift of music. Forget the candy and teddy bears, give your loved one memories that’ll last a lifetime. Now, when you buy a pair of tickets, we’ll include a bonus gift! 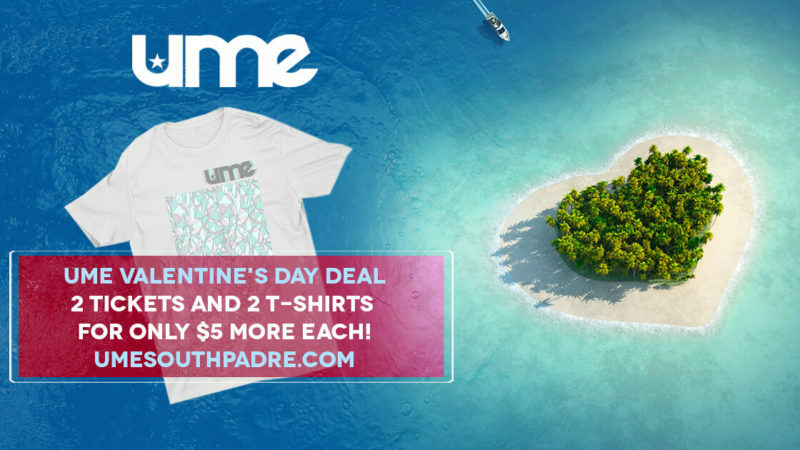 For just $5.00 each, take home two (2) t-shirts for the Ultimate keepsake. No doubt, 2-day festival passes are a total turn-on that’ll have your special someone falling head-over-heels. 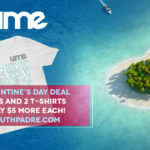 Whether you go GA or VIP, add-on a piece of merch for a little something to hold onto, because couples that dance together will remember UME forever. Shop the sale until midnight (11:59 PM EST) on Thursday, February 15th. Go ahead, wear your heart on your sleeve! To collect your gift, present a copy of your ticket voucher at the official merch booth on-site. Sizes and colors are available on a first come, first serve basis. Here's Your Chance to Play at SMF! 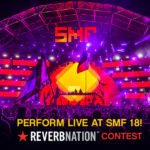 If you’re ready to take your DJ sets to the next level, enter our ReverbNation contest to win a timeslot at this year’s Sunset Music Festival! One lucky artist will earn the chance to open a stage among megawatt talents of today. Jumpstart summer in the Sunshine State with an unforgettable gig! The winning producer will enjoy a deluxe prize pack including pay, covered travel costs including hotel and airfare, convenient transportation, plus a hospitality rider. 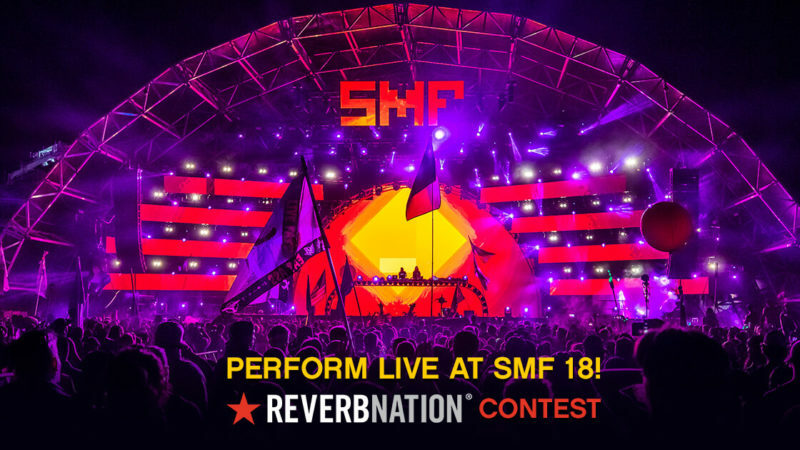 It doesn’t get any better than that, so join us on the journey to SMF and submit your ReverbNation press kit for a chance to take home the grand prize! Open to artists based in the US only. Go Back to School Happy With 10% OFF Tickets! Regardless of whether you were ready for vacation to end, the winter holidays are over now that class is back in session. Sail into the new year with 10% OFF festival passes to Sunset Music Festival, the freedom of summer will be here before you know it! Beat the post-break blues while our Back to School Sale is extended for another week of savings. Resolve to make the spring season worthwhile and seize the moment to load up your social calendar while there’s a special discount on tickets. Enter the promotion code at checkout to shop the sale, now valid until midnight (11:59 PM PST) on Monday, January 29th. Sail Into the New Year With 10% OFF! Ready or not, class is back in session! It’s time to dig in after winter holidays, regardless of whether you’re ready for vacation to end. Our back to school essentials include prevention of the post-break blues, with a special offer to save 10% OFF tickets! The freedom of summer will be here before you know it, as you resolve to make the spring season count. Start planning your annual visit to the Sunshine State and rest easy knowing the months ahead will be worthwhile. Seize the moment to load up your social calendar while there’s a special discount on festival passes running all week long. Enter the promotion code at checkout to shop the sale, valid until midnight (11:59 PM PST) on Monday, January 22nd. 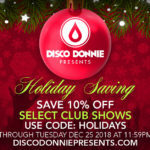 10% Off Holiday Sale Extended Through January 2nd! 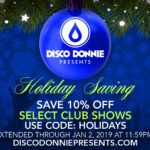 To ensure you deck the dance halls this holiday season we're offering a special sale for 10% OFF tickets to select events. Ring in the Holiday While Tickets Are 10% OFF! 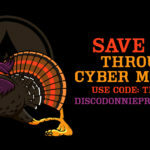 Gobble up the savings and take 15% OFF club shows brought to you by Disco Donnie Presents until midnight on Cyber Monday. Back to School with 10% Savings on Select Events! 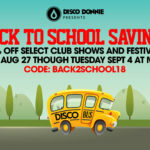 Mark your calendars and don't forget to take advantage of Disco Donnie Presents' back to school sale! Blast Off at Frequency Burst in Orlando! 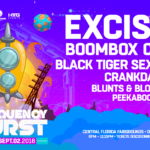 Orlando - get ready to blast off on an exploration of sound this Labor Day weekend on Sept 2nd at the Central Florida Fairgrounds. Ready to Go Nowhere? 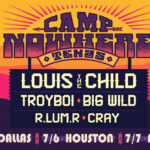 Join Us at Camp Nowhere 2018! Assemble your troop and journey to Nowhere this Summer to experience summer camp vibes without the camping. Plan, Promote, and Party With the Dallas Ambassador Program! We're looking for motivated leaders across the Dallas area to help spread the word about festivals and events produced by Disco Donnie Presents. 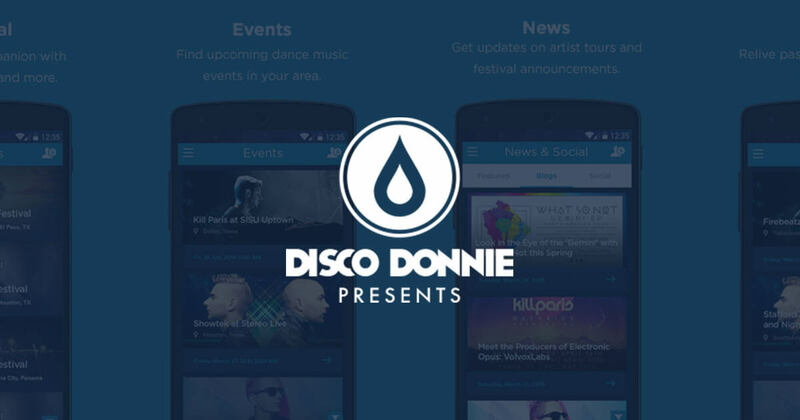 Step inside the world of Disco Donnie Presents with our mobile app from the Google Play and Apple iTunes stores! Grab festival passes to the springtime celebration today and take advantage of the lowest available price. We'll revel in the underworld of electronic artists and get into the spirit of Freaky Deaky as we adventure across festival grounds to explore what lies beyond. Early bird tickets to Freaky Deaky 2018 in Houston, Texas are now on sale! 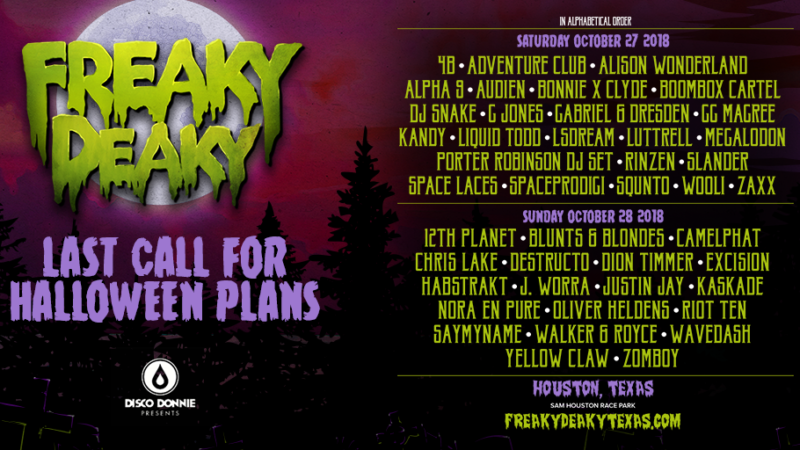 Darkness descends on Houston as we proudly announce the arrival of 2018's halloween festival - Freaky Deaky! 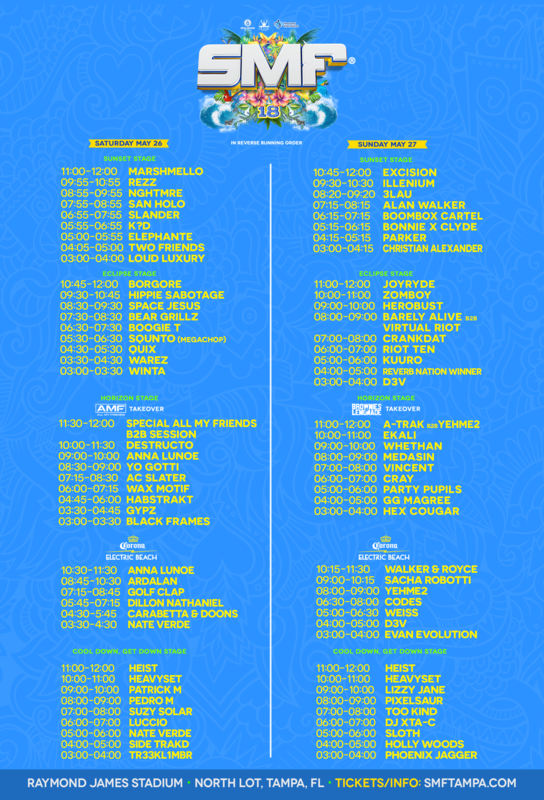 For your summer listening pleasure, view the complete lineup of Sunset Music Festival 2018 on Memorial Day weekend at Raymond James Stadium! Take home the Ultimate gift for your Valentine! For a limited time, when you buy a pair of tickets, throw in t-shirts for two and relish the memories for years to come. Submit your ReverbNation press kit and enter to win the grand prize including a DJ slot at Sunset Music Festival on Memorial Day weekend. Beat the post-break blues while our Back to School Sale is extended until midnight (11:59 PM PST) on Monday, January 29th. Winter break is over and class is back in session, to make the year ahead worthwhile shop the sale for a 10% discount until at midnight (11:59 PM PST) on Monday, January 22nd. Start the Year With 10% OFF Tickets! Winter break is over and classes are back in session, to make the year ahead worthwhile shop the sale for a 10% discount until at midnight (11:59 PM PST) on Monday, January 29th. 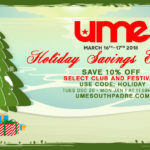 Enjoy 10% OFF Tickets for the Ultimate Holiday! The holiday sale for 10% OFF festival passes to Ultimate Music Experience 2018 has been extended until midnight (11:59 PM CST) on New Year's Day. 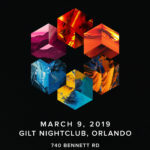 Photos from Jason Ross at Gilt Nightclub in Orlando, Florida on Saturday, March 9, 2019. 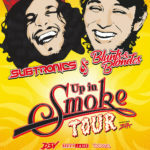 Photos from Subtronics, Blunts & Blondes at The Ritz Ybor in Tampa, Florida on Friday, March 8, 2019. 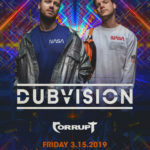 Photos from DubVision at Dahlia Nightclub in Columbus, Ohio on Friday, March 15, 2019. Photos from DallasK at Varsity Tavern in Tempe, Arizona on Thursday, March 21, 2019. 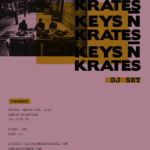 Photos from Keys N Krates at Dahlia Nightclub in Columbus, Ohio on Friday, March 8, 2019. 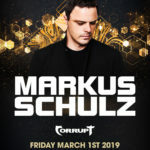 Photos from Markus Schulz at Dahlia Nightclub in Columbus, Ohio on Friday, March 1, 2019. Photos from Sam Feldt at Dahlia Nightclub in Columbus, Ohio on Saturday, March 9, 2019. 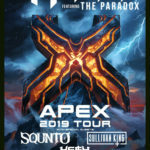 Photos from Excision, SQUNTO, Sullivan King, Hesh at The Pavilion in Indianapolis, Indiana on Friday, March 1, 2019. 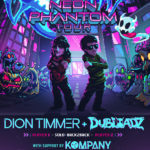 Photos from Dion Timmer, Dubloadz, Kompany at Gilt Nightclub in Orlando, Florida on Saturday, March 2, 2019. 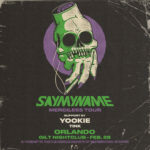 Photos from Say My Name, YOOKiE, Tink at Gilt Nightclub in Orlando, Florida on Thursday, February 28, 2019. 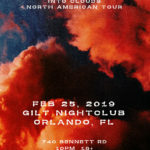 Photos from Luttrell at Gilt Nightclub in Orlando, Florida on Monday, February 25, 2019. 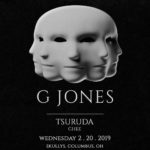 Photos from G Jones, Tsuruda, Chee at Skully’s Music-Diner in Columbus, Ohio on Wednesday, February 20, 2019. Video from DallasK at Varsity Tavern in Tempe, Arizona on Thursday, March 21, 2019. 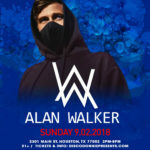 Video from Alan Walker at Cle in Houston, Texas on Sunday, September 2, 2018. Video from Phiso at The Ritz Ybor in Tampa, Florida on Friday, January 20, 2017. 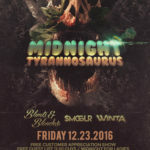 Video from Midnight Tyrannosaurus at The Ritz Ybor in Tampa, Florida on Friday, December 23, 2016. 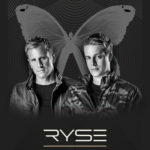 Video from Tritonal at Ryse Nightclub in St Charles, Missouri on Saturday, December 10, 2016. 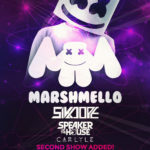 Video from Marshmello, Sikdope, Speaker Of The House, Carlyle at Stereo Live Dallas in Dallas, Texas on Friday, December 16, 2016. 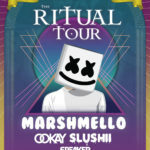 Video from Marshmello, Ookay, Slushii, Speaker Of The House at The Pageant in Saint Louis, Missouri on Saturday, December 3, 2016. 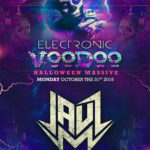 Video from Jauz, 4B at Buchanan’s Event Center in El Paso, Texas on Monday, October 31, 2016. 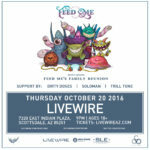 Video from Feed Me at Livewire in Scottsdale, Arizona on Thursday, October 20, 2016. Video from Krewella at Maya Day and Nightclub in Scottsdale, Arizona on Friday, September 23, 2016. 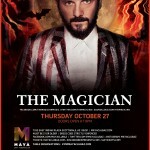 Video from The Magician at Maya Day and Nightclub in Scottsdale, Arizona on Thursday, October 27, 2016. 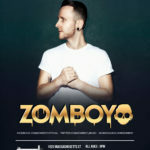 Video from Zomboy at Granada Theater in Lawrence, Kansas on Saturday, September 17, 2016.